I noticed something in my Google Webmaster Tools account the other day for one of my websites and it dawned on me how important it was to include alt tags for all your images. Not just to include them but also give extra thought to the words you include in them. 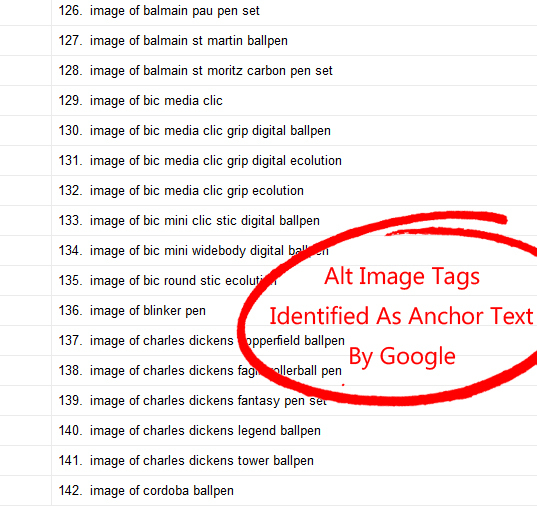 My webmaster data shown that Google treats alt image tags the same way as it does traditional anchor text. We all know that we should use them from an SEO point of view as it gives some information about our “image”. 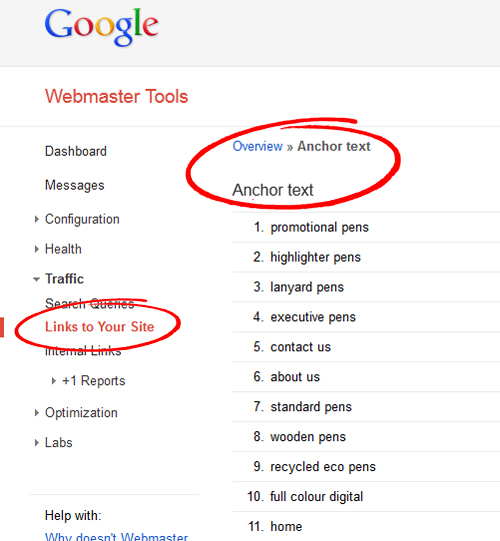 However, going by the data in my Google Webmaster Tools they have treated all my alt image tags as “anchor text”. Those anchor texts are my “alt tags” for images that link to product pages on one of my sites. It means that you should always look at including alt image tags to images that “link” to your website or other pages. That alt tag text will be identified as anchor text in the eyes of Google. Find related keywords and add a short description using LSI keywords. This will add an overall theme to your backlink profile and will help to increase your search engine rankings. When creating content on web 2.0 sites or social sites, add relevant alt tags to your images and link back to your own webpages for more backlink juice. Whilst we are on the subject of backlinks and anchor text, if you haven’t yet checked out Syndication Rockstar [HERE] then I would recommend you do before it closes soon. Syndication Rockstar is a really powerful WordPress plugin that allows you to automatically syndicate versions of your blog posts to other web 2.0 sites and self hosted WordPress sites when you publish them. It’s a very good plugin for getting your content out there and building lots of new quality backlinks. Check it out HERE. All those that grab that plugin within the next day or two will also get 5 big bonuses from me including Answer Analyzer (research software), Article Research Bot (research software), Link Magnet (report by Sean Donahoe), Power Pinger (WordPress plugin by SeanDonahoe) and a graphics pack (icons, buttons etc). First let me tell you the combination of “Constant Content The Google Gift” and “Onsite Tycoon” is producing a T O N of my content being syndicated. I have a question about SEO. I sucked before implementing the teachings from Constant Content The Google Gift, which has my visitor counts now through the roof (along with a few placement strategies as a case study for jamesboulay) was all I did before Onsite Tycoon. I’ve notcied a ton of SE traffic and I do no additional SEO work. My question is if SEO is slowly completely dwarfing onsite andmaking a huge push toward regular content (CCTGG has me pushing out authority articles in zero time, maybe 2-4 minutes a pop), socialization via different IP’s and news based or trending topics? Again I ask because the stuff you have me getting syndicated is literally the only SEO I do and my average post on niche sites (I don’t like reverse engineering so I didn’t use my site in the field above) get 50 tweets and 400 likes within a few hours of posting and replacing on my FB Pages. Also, isn’t there a big push from the Google beuracracy/tyrancy against over optimization and how do we know what that is? Over optimization is just that… putting too much emphasis on specific keywords, rather than using optimization to theme a web page. Sites that pushed the same “keyword” in all the onpage elements such as title tag, description, meta keywords, header tags, alt tags, footer links etc seen a serious drop in rankings. That also went for offpage optimization too. My post was about the “realization” that Google is seeing the alt tags in image links as anchor text and is showing it as that in their webmaster tools. Just remember not to “keyword stuff” and target the same keyword. Themed keywords is what it’s about. Also, this applies to images that “link” to another page.